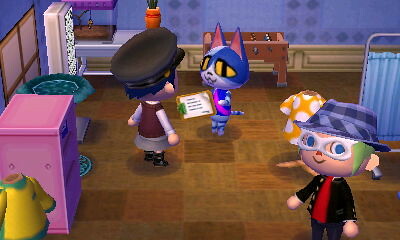 It has been a busy week for Mayor Neko and the Town Hall. Two construction projects were completed, and one more has gone into the planning stages. 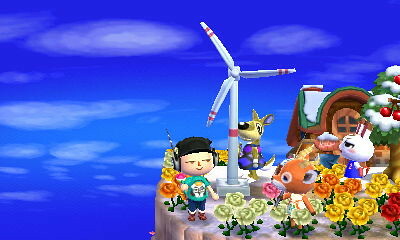 An earth-friendly Windmill has been constructed in Wasabi to bring in some renewable fuel sources. On a windy day you can hear the “whoosh” of the Windmill from pretty far away! The townies are all very excited for this new Public Work, especially Teddy, since the Windmill was built right near his house. 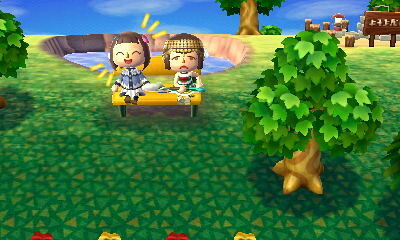 Mayor Neko is also quite pleased, she can see the Windmill from her house – it’s right across the river! 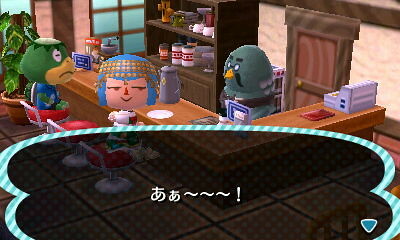 3/1 – Cafe is Now Open! Read our headline story for all the details! Construction and funding began on 2/25 and only 4 days later, the Cafe was fully funded and constructed. Mayor Neko attributes the fast turnaround to the “helpful donations of the residents of Wasabi, as well as the Resort Island for having an abundance of rare beetles to sell.” Thank you to everyone who contributed to this Public Work project! 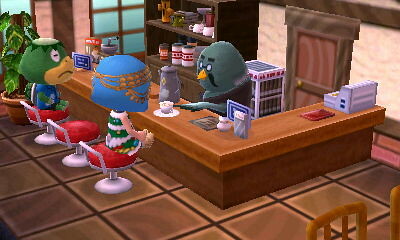 Blathers, the curator of the Wasabi Museum, was especially pleased to see the coffeeshop, as he and Brewster are old friends. 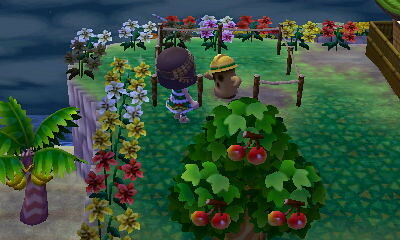 Any Wasabi resident would agree that one of the main attractions of their town is the Mayor’s Estate. Located in a private nook by the beach, Mayor Neko’s large two story mansion is surrounded by Delicious Cherry Trees and guarded by hedges. In an effort to make the Mayor’s Estate even more beautiful, Mayor Neko opted to decorate the outside of her house in the Cabana Style. 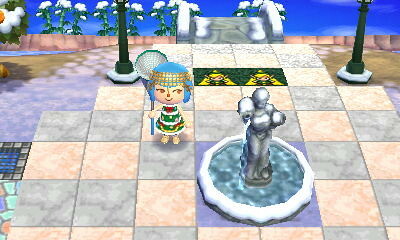 In addition, Mayor Neko has set up funding for what is being dubbed as the Mayor’s Fountain. 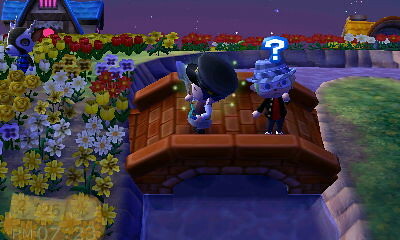 The Mayor’s Fountain is going to be situated right next to the Mayor’s house, overlooking the waterfall and beach area. The Wasabi News is excited to see the finished product! Fundraising has already begun, and at the time of printing, the Mayor’s Fountain only needs ฿80,000 to reach completion. 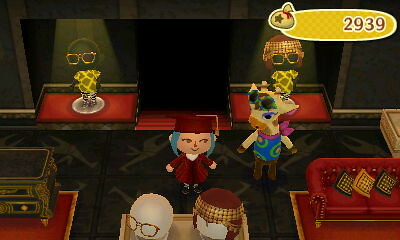 If you’d like to donate, please visit the Gyroid next to Mayor Neko’s house. Much to everyone’s surprise, spring came early this year in Wasabi! On 2/25, the snow officially melted away, revealing lush green grass underneath. While almost everyone is very excited for the new fish and bugs of springtime, only one wasn’t happy about the arrival of spring… the poor Snowman. 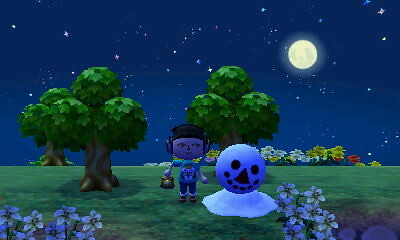 😦 For the information of our readers, the Wasabi News would like to remind anyone playing AC:NL that if you have a Snow Daddy, he will not play Snowman Bingo with you once the seasons change. Be aware! Occasionally, one of the townies will come up with a brilliant idea for something or other, for which they will want a petition signed. When this happens, it is up to the Mayor to visit another town to collect signatures. (That’s right – you cannot simply ask your own townies to sign a petition! They are obviously biased.) So when Kitt approached Mayor Neko on 2/26 to have a petition signed, Mayor Neko took it upon herself to visit the neighboring Kasen Village to get the necessary 6 signatures – and also check out the Meteor Shower while she was there! The Kasen townies were more than happy to oblige, and Mayor Neko’s task was completed easily, leaving plenty of time for her and Mayor Yumi to take some adorable photos. 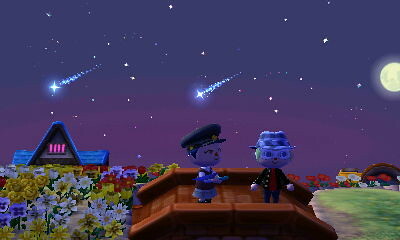 When you see a shooting star, don’t forget to make a wish! Soo… can anyone tell us what the Petition was for, anyway? 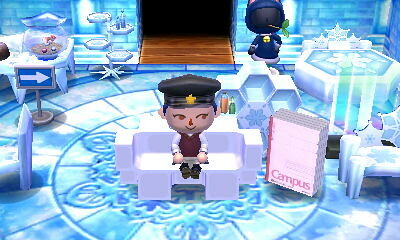 The latest installment of the Campus DLC series was distributed on 2/27 via a Letter from Nintendo. This week’s special furniture is the Eraser Bench. Like the Campus Notebook Closet, this Eraser Bench can be redesigned in a variety of colors, and costs an exorbitant amount of money to buy from the Catalog Machine in the Nook Shops. After a quick reconstruction on 2/27, the Nookmart has expanded once again! This time, the Nookmart is even bigger, and now the Flower Shop next door has a side entrance incorporated directly into the Nookmart! 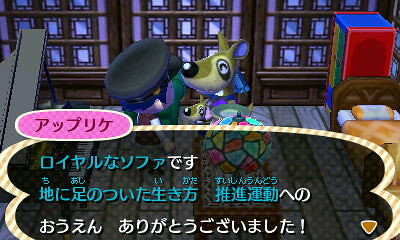 In addition, there are now 5 furniture items available for sale per day, 2 carpets and 2 wallpapers per day, as well as a new item – K.K. Slider albums! The Flower Shop has also expanded their inventory, now offering shrubbery on a daily basis. Being the Mayor of a thriving village is no easy task. Mayor Neko spends countless hours fundraising for Public Works, checking the Stalk Market for decent prices (the Wasabi Stalk Market maxed out at ฿153 this week, not too great but at least no money was lost), and of course making connections with Mayors from other towns. This week, Mayor Neko made three trips abroad! 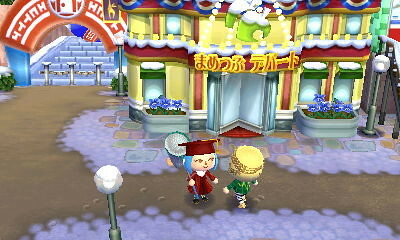 As described earlier in the Wasabi News, Mayor Neko visited Kasen Village on 2/26. 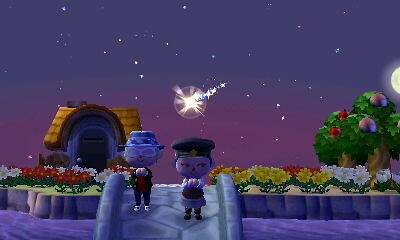 In addition to this, she visited Mayor Zen and Mayor Aya. 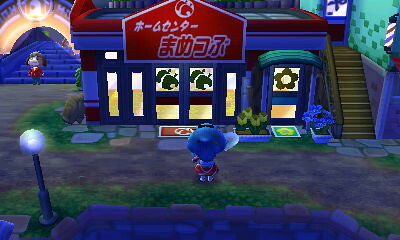 Zui Village has the astounding Department Store! 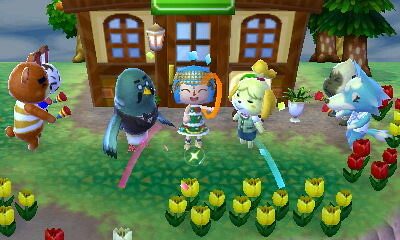 Visiting with Gracie in the Department Store, and dropping a pretty penny on some fabulous fashions! 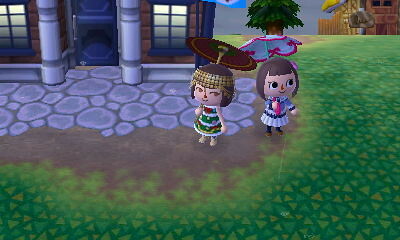 It was raining in Shakure – thankfully both Mayors had umbrellas! 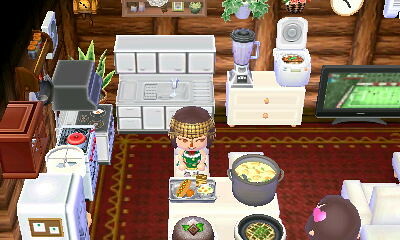 A delicious meal was set up on the table in Mayor Aya’s house! 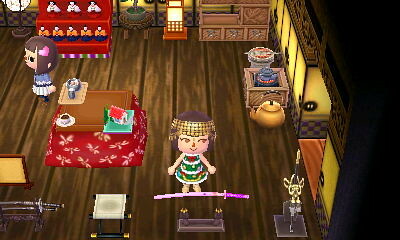 A Japanese themed room in Mayor Aya’s house looks like it is prepared to celebrate Girl’s Day on 3/3! Dainty cakes will be served! Yummy! Spend the day hunting for eggs! Eggs can be found in the ground, floating in balloons, hiding in trees, even in the river! Rumors claim that you can even go diving and find Easter Eggs during this holiday. Inside each egg is a special foil which can be used to trade in for the limited edition Egg Series. Be careful – the villagers are set to play pranks on you! Poor snowman! Spring looks lovely, though.